ABS-CBN TV Plus is a digital television service of ABS-CBN Channel in the Philippines, it is a TV tuner, receiving digital signal from local free channels in the Philippines. It is a replacement for your analog antenna hanging on your roof that might get struck by lightning on a stormy weather. The TV software or firmware can be upgraded via USB or over the air (OTA). Aside from ABS-CBN Channel and ABS-CBN Sports and Action (formerly Studio 23), the digital box has 4 more exclusive free channels like; Cinemo Channel, an all day movie channel like Cinema One, showing blockbuster Filipino movies and sometimes Hollywood movies ; Yey! Channel, a channel for your children, it shows movies, animations, cartoons, and program that's suitable for children like Hero TV on a cable channel; Knowledge Channel, a free public educational channel and created to teach or guide Filipino students from Elementary to High School; and DZMM TeleRadyo (TeleRadyo means Television Radio) Channel, an AM radio channel of ABS-CBN, showing live inside DZMM's radio station studio while broadcasting. Aside from ABC-CBN's affiliate or owned channels, the digital box also receives digital channel of competing television channels like GMA 7, TV 5, PTV 4, and UNTV. The clarity or availability of other channels, depends on the strength of digital signal in your area where you are living. As of today, the coverage area includes Metro Manila, Bulacan, Nueva Ecija, Pangasinan, Rizal, Laguna, Pampanga, Tarlac, Benguet, and Cavite. 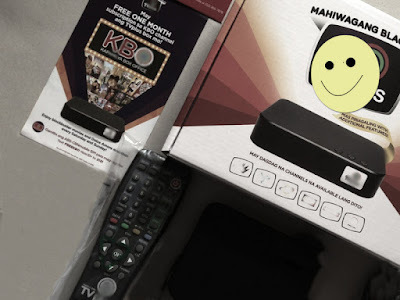 Inside the box, aside from the unit and its accessories, it also comes with ABS-CBN mobile sim card that is used to activate the unit's additional exclusive free channels (Yey!, Cinemo, Knowledge, and DZMM TeleRadyo). At first use, by default, the exclusive channels are not yet available. So don't throw away or give away the included sim card inside the box, you might need it someday to activate exclusive shows, channels, or special broadcasts (like Manny Paquiao vs Floyd Mayweather). The digital box can be used in any television, as long as it has an AV (Audio Video) input. If you can play a DVD player on your television, then you can use the digital box. The unit does not connect thru your analog's antenna socket, so you can easily switch between analog and digital signal. The unit is available in any electronic and appliance center in the Philippines. It costs PHP1,499 one-time payment, no installation fee, and no monthly fee. it is also available online (click here) on their official store. For more and updated information, visit their website.